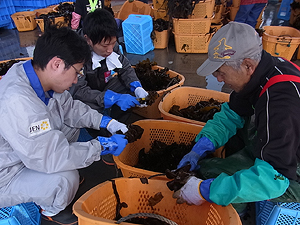 Activities to help re-establish the fishing industry in Minamisanriku, a town in Miyagi Prefecture that was hit hard by the tsunami, have been part of the Ricoh Group’s training program for new employees for four years (2012-2015). These activities contribute to community rebuilding in the disaster area and also serve an educational purpose as new employees are able to gain a different perspective and learn a different skill while lending a helping hand. Over the four years, a total of 816 new Group employees participated in the program, sent to different locations in the area in groups to work alongside members of the local fishing industry. From December 4 to 6, 2015, Ricoh Japan Corporation (President and CEO: Kunihiko Sato) carried out a support activity project to help with reconstruction of the community in the Miyakoji district of Tamura City, Fukushima Prefecture. 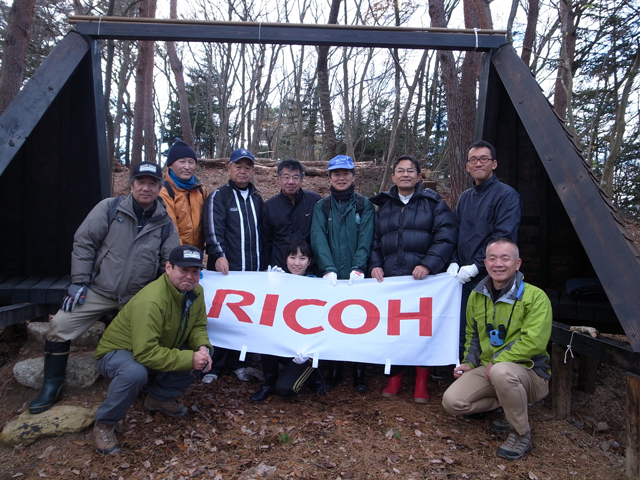 This is the eighth activity under the project that was started in 2014 by the RICOH JAPAN Volunteer Team. A total of 100 employee volunteers including the secretariat staff have participated in the project. A pamphlet published by the Children's Community Building Club. On August 6, 2011, the Ricoh Group and the National Museum of Emerging Science and Innovation cohosted the Student Reconstruction Conference in Iwate Prefecture. Students explored the theme of community building as it applied to the reconstruction of their hometowns. The ideas the students produced were passed on to the Children's Community Building Club led by Save the Children Japan. 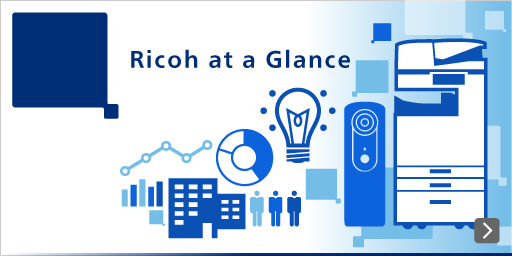 Ricoh is continuing to support the students in various ways, including printing their reports, brochures and survey results. The program was run for five years and completed in December 2015. Through the program, the students developed strong motivation to participate in rebuilding the town. It is expected that they will now serve as leaders in the reconstruction of Rikuzentakata and other municipalities affected by the earthquake and tsunami. The Ricoh Group companies regularly organize fairs showcasing the local products of three prefectures in the Tohoku region on the premises of the companies to support reconstruction of local industries through product purchases. Since August 2014, we have been donating a portion of sales to an organization that supports children who lost their parent(s) in the disaster in three affected prefectures. In February 2015, Ricoh Leasing held the Tohoku Rebuilding Local Products Fair to showcase products from Iwate Prefecture. From June 2011 to March 2012, Ricoh vehicles equipped with MFPs and PCs made regular rounds of temporary housing in areas damaged by the Great East Japan Earthquake to print and copy municipal announcements, certificates and other documents. This led to a close relationship with Higashimatsushima City in Miyagi Prefecture, which in turn evolved into the "Revitalizing Higashimatsushima as a Future City" program run in cooperation with the Higashimatsushima Organization for Progress and Economy, Education, Energy (HOPE). Ricoh Japan Corporation, a sales subsidiary in Japan, is taking the lead in two facets of this progam, the School in the Forest, and assistance for senior citizens. From August 2013, two Ricoh employees were involved in disaster reconstruction support activities as special staff of the city of Kamaishi in Iwate Prefecture. They worked for two years for the Kamaishi satellite office of the Tohoku Future Creation Initiative, a cooperative, cross-sector effort encompassing industry, government, academia, and the public, with a mission to support reconstruction of the area severely affected by the Great East Japan Earthquake and the ensuing tsunami, and the creation of a new future there. 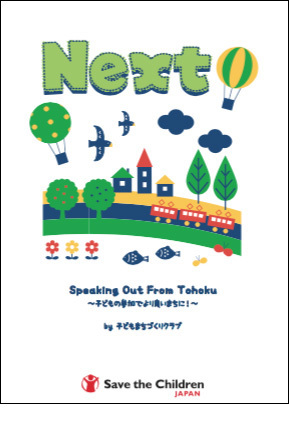 The employees tackled two issues: developing young business leaders (particularly in their 30s and 40s) on whose shoulders rest the future of the Kamaishi-Otsuchi region; and promoting concrete reconstruction plans for Kamaishi. The Save the Memory Project is Ricoh’s reconstruction support activity conducted after the Great East Japan Earthquake and tsunami in 2011, whose aim is the return to their owners of photos lost and damaged in the tsunami. The tsunami washed away and ruined an enormous number of photos, which represent irreplaceable memories and traces of the lives of the people affected by the disaster. Using multifunction printers (MFPs), we collected, cleaned, scanned and digitized more than 400,000 photos found in the devastated areas. The digitized image data were then stored in the cloud to enable easy searching on the web using a PC browser. These efforts made it significantly easier for people to find their photos and resulted in the return of almost 90,000 photos as well as their digitized image data to their owners. We have decided to summarize our activities in the four years between 2011 and 2015 for future reference. We hope that this record will help improve people’s awareness toward disaster prevention and, should another disaster occur, will serve as useful reference for those involved in reconstruction support activities. After being devastated by the tsunami caused by the 2011 Great East Japan Earthquake, the Nobiru region of Higashi-matsushima City in Miyagi Prefecture has been working to relocate the whole community to a new area with a higher elevation. Nobiru Elementary School is also being relocated to new ground at a higher elevation. The forest adjacent to the new school building is to be preserved as “woodlands for regeneration”, including the School in the Forest, for the enjoyment of the local community. The Ricoh Group joined the efforts by the Higashi-matsushima government and C.W. Nicol Afan Woodland Trust, as well as local people, and supported the construction of the “Sound Shelter,” where people can listen to the sounds of the forest. 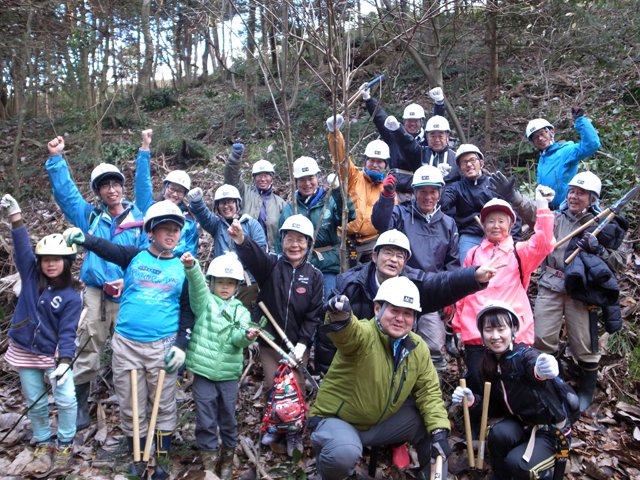 On Saturday, November 28, 2015, employees of group companies in the Sendai area (Ricoh Japan Corporation, Ricoh Industry Co., Ltd., and the General Electronics R&D Center) joined local residents in cleaning up the forest floor by removing bamboo and thinning the trees.